2017-11-03 : Exclusive preview of Norilsk's 'Ghosts of Loss'. Doom-metal.com is very pleased to present an exclusive streaming of new preview track 'Ghosts of Loss', from Norilsk's forthcoming sophomore album 'Le passage des glaciers', in cooperation with Hypnotic Dirge Records. 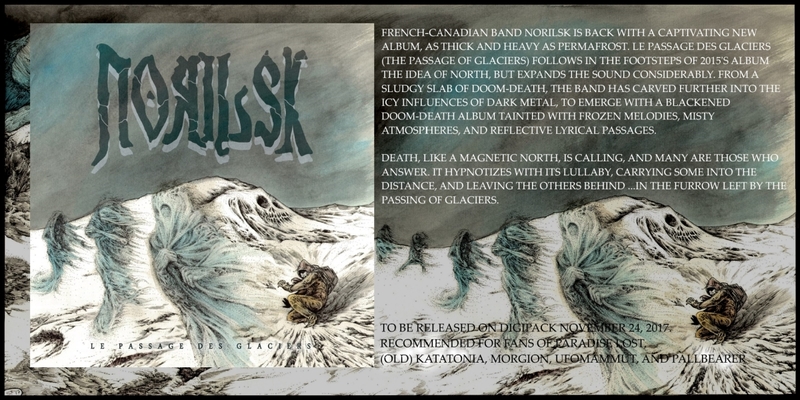 "Hypnotic Dirge Records is set to release Norilsk's new album Le passage des glaciers (The Passage of Glaciers) on November 24. The Canadian metal outfit invites Winter and darkness into our homes this month, carrying the cold touch of doom and death. Norilsk's latest offering will feature guest vocal appearance from Pim Blankenstein (Officium Triste, The 11th Hour, Extreme Cold Winter, Clouds) on song 'Ghosts of Loss.' Nic Miquelon comments: “When I wrote 'Ghosts of Loss', I had in mind bands like Officium Triste and others from the mid-late 90's that marked the genre and are still extremely relevant today. Pim's signature low death growls and spoken words were a natural fit for this song, and we couldn't feel more honored that he accepted to do this guest appearance”. The album will also feature lead guitarist Martin 'Mort' Marion (Outrage AD, Maggie Astor Creed) on 'Noirceur intérieure.' Marion had collaborated with the band on their 2015 album The Idea of North, and has been known locally for capturing the vibe of traditional doom guitar solos." More information on the new Norilsk website. Preorders coming shortly at the Hypnotic Dirge webstore.